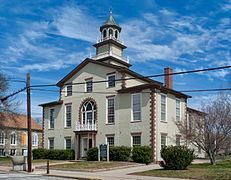 Bristol is a town in Bristol County, Rhode Island, as well as the county seat. It is a deep-water seaport named after Bristol, England. The population of Bristol was 22,954 at the 2010 census. Major industries include boat building and related marine industries, manufacturing, and tourism. 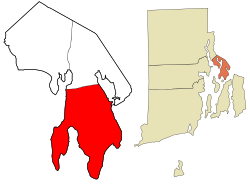 The town's school system is united with neighboring Warren, Rhode Island. Prominent communities include Luso-Americans (Portuguese-Americans), mostly Azorean, and Italian-Americans. Before the Pilgrims arrived in 1620, the Wampanoags occupied much of New England, including Plymouth, Cape Cod, and Narragansett Bay. The Wampanoags had previously suffered from a series of plagues which killed off large segments of their population, and Wampanoag leader Massasoit befriended the early settlers. 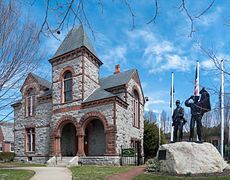 :10 King Philip's War was a conflict between the Plymouth settlers and the Wampanoags, and it began in the neighboring area of Swansea, Massachusetts. Metacomet made nearby Mount Hope (a corruption of the Wampanoag word Montaup) his base of operations; he died following an ambush by Captain Benjamin Church on August 12, 1676.:11 "King Philip's Chair" is a rocky ledge on the mountain which was a lookout site for enemy ships on Mount Hope Bay. The DeWolf family was among the earliest settlers of Bristol. Bristol and Rhode Island became a center of slave trading. James DeWolf, a leading slave trader, later become a United States Senator from Rhode Island. Quakers from Rhode Island were involved early in the abolition movement. A view of Bristol RI from the harbor. 1886 engraving. During the American Revolutionary War, the British Royal Navy bombarded Bristol twice. On October 7, 1775, a group of ships led by Captain Wallace and HMS Rose sailed into town and demanded provisions. When refused, Wallace shelled the town, causing much damage. The attack was stopped when Lieutenant Governor William Bradford rowed out to Rose to negotiate a cease-fire, but then a second attack took place on May 25, 1778. This time, 500 British and Hessian troops marched through the main street (now called Hope Street (RI Route 114)) and burnt 30 barracks and houses, taking some prisoners to Newport. Until 1854, Bristol was one of the five state capitals of Rhode Island. Bristol is home to Roger Williams University, named for Rhode Island founder Roger Williams. The southerly terminus of the East Bay Bike Path is located at Independence Park on Bristol Harbor. The bike path continues north to East Providence, R.I., constructed on an old abandoned railway. Some of the best views of Narragansett Bay can be seen along this corridor. This path is a valued commodity to Bristol; it allows bikers, roller skaters, and walkers to enjoy the area. The construction of the East Bay Bike Path was highly contested by Bristol residents before construction because of the potential of crime, but it has become a welcome asset to the community and the anticipated crime was non-existent. The Bristol-based boat company Herreshoff built five consecutive America's Cup Defenders between 1893 and 1920. The Colt Estate, now known as Colt State Park, was home to Samuel P. Colt, nephew of the man famous for the arms company, and founder of the United States Rubber Company, later called Uniroyal and the largest rubber company in the nation. 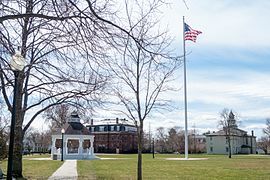 Colt State Park lies on manicured gardens abutting the West Passage of Narragansett Bay, and is popular for its views of the waterfront and sunsets. Bristol is the site of the National Historic Landmark Joseph Reynolds House built in 1700. The Marquis de Lafayette and his staff used the building as headquarters in 1778 during the Battle of Rhode Island. Start of the 231st Bristol Fourth of July Parade in 2016. This being the first anniversary of the Declaration of Independence of the Rebel Colonies, they ushered in the morning by firing 13 cannons, one for each colony, we suppose. At sunset, the rebel frigates fired another round of 13 guns, each one after the other. As the evening was very still and fine the echo of the guns down the Bay had a grand effect. The annual official and historic celebrations (Patriotic Exercises) were established in 1785 by Rev. Henry Wight of the First Congregational Church and veteran of the Revolutionary War, and later by Rev. Wight as the Parade, and continue today, organized by the Bristol Fourth of July Committee. The festivities officially start on June 14, Flag Day, beginning a period of outdoor concerts, soap-box races and a firefighters' muster at Independence Park. 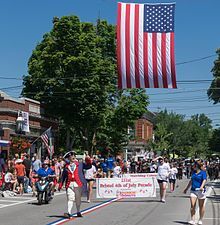 The celebration climaxes on July 4 with the oldest annual parade in the United States, "The Military, Civic and Firemen's Parade", an event that draws over 200,000 people from Rhode Island and around the world. These elaborate celebrations give Bristol its nickname, "America's most patriotic town". Bristol is represented in the parade with hometown groups like the Bristol Train of Artillery and the Bristol County Fifes and Drums. 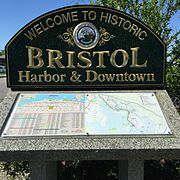 Bristol is situated on 10.1 square miles (26 km2) of a peninsula (the smaller sub-peninsula on the west is called Poppasquash), with Narragansett Bay on its west and Mount Hope Bay on its east. According to the United States Census Bureau, the town has a total area of 20.6 square miles (53.4 km2), of which, 10.1 square miles (26.2 km2) of it is land and 10.5 square miles (27.2 km2) of it (50.99%) is water. Bristol's harbor is home to over 800 boat moorings in seven mooring fields. As of the 2010 census Bristol had a population of 22,954. The ethnic and racial composition of the population was 94.9% non-Hispanic white, 0.8% Black, 0.1% Native American, 0.9% Asian, 0.4% some other race, 1.4% from two or more races and 2.0% Hispanic or Latino of any race. As of the census of 2000, there were 22,469 people, 8,314 households, and 5,653 families residing in the town. The population density was 2,222.2 people per square mile (858.1/km2). There were 8,705 housing units at an average density of 860.9 per square mile (332.4/km2). The ethnic group makeup of the town was 97.14% White, 1.29% Hispanic or Latino (of any race), 0.67% Asian, 0.62% African, 0.16% Native American, 0.04% Pacific Islander, 0.33% other ethnic group, and 1.03% from two or more races. District 10: Walter S. Felag, Jr.
^ MacKay, Scott (October 7, 2013). "Why I'll Never Call Myself a Bristolian". One Square Mile (story series). Rhode Island Public Radio. Retrieved September 2, 2017. ^ a b c d Susan Cirillo; Lombard John Pozzi (1980). Bristol: Three Hundred Years. Providence, Rhode Island: Franklin Graphics. OCLC 6811058. ^ Simpson, Richard V. (2002). Bristol: Montaup to Poppasuash (RI). Making of America. Mount Pleasant, S.C.: Arcadia Publishing. ISBN 0-738523-56-9. ^ "Annual Fourth of July Celebration | Bristol, Rhode Island". July4thbristolri.com. Retrieved 2013-07-01. 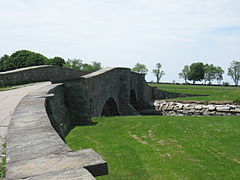 Wikimedia Commons has media related to Bristol, Rhode Island. 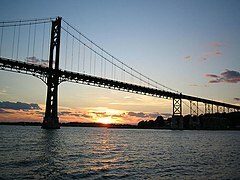 Wikivoyage has a travel guide for Bristol, Rhode Island. Wikisource has the text of the 1911 Encyclopædia Britannica article Bristol (Rhode Island).